"...we have been monitoring the temperature, and we were shocked..."
Condenser control that provides energy savings over 50% compared to traditional, mechanically controlled systems. Ideal for multi-fan condensers, air handlers, and cooling towers. 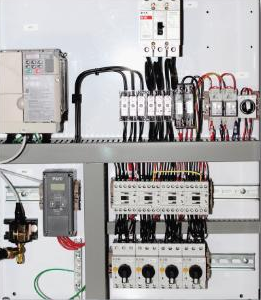 Pre-wired controller reduces installation time and errors associated with field installation. Includes VFD, reactor, contactors, motor overload safeties, transformers, fuses and circuit breakers all properly sized for the voltage and current requirements of the fans.